Welcome to the discussion thread for Love Live! Sunshine!! Second Season, Episode 3. 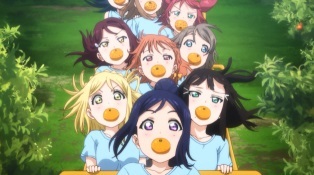 Love Live, you did it again. The new song and performance are amazing. I love it when I instantly click to a new song. The choreography and cinematography are real fun, and Ruby DID A FANTASTIC JOB with the outfits. I LOOOVE them. Dia looked especially pretty in hers. Wow! The surprise here was at the end with a re-purposed Kimi No Kokoro Wa Kagayaiteru Kai? performance. The best difference between the TV version and the full version was that at the very end of the performance where you see the girls come in on the screen one by one. In the TV version, they reversed it. So it's like seeing the original scene byt rewinded. I love little changes like that. Also, Mari's "Woops" when she stepped on the map had he killed and revived. So funny. It just few days ago we got news that Kimi No Kokoro Wa Kagayaiteru Kai? would be in the second season. Didn't think it would happen this fast. "Not even Yoshiko's ideas are this crazy"
That's why Chika is the leader! Yet another fun and even inspiring episode for Aqours, from the always welcome Yoshiko bullying to Chika pulling through by insanity, hope and the courage to try, and that speech near the end was great too. Of course, I also have to bring up that sweet moment between Dia and Ruby, and yes, that full shot of Dia was quite lovely. Speaking of, Dia episode next week! Yes! I was fearing she'd never get one, and judging by the title, it looks she's following Eri's steps allright. That was a fun episode, but this show isn't clicking with me the same way the original did. I'm not sure why, maybe because it's so similar to the original? I still like it and I've said as much when the show returned, but I'd definitely rank Sunshine way below the original. Enjoyable episode. Yohane can grappl e with two persons at once... I notice that Zura likes to tease her. And surprised by their choice of costume for the contest.. first time I've seen those. Really cute. seriously yohane it's so funny lol. Just looking at the bright side this episode did a lot of good things. The drama was solid with the group struggling between two impossible choices. They really worked through their options and tried their best to find the optimal result. And there were some really cute moments like with Dia and Ruby. And can look at the end result of this whole thing as pretty much a win for optimism. Performances were enjoyable too. But....there are some issues. For one, if Chika had that plan....why did they still split up!? Clearly from the reactions they didn't expect to have the full group at the Love Live qualifiers since the group that showed up later didn't expect to be running back to the school. So at best Chika's plan would have given them half a team at the Love Live qualifier and then the full group at the school. Which would have left them understandably pissed at her for not telling them anything if they fell short at the competitive aspect. Yeah it all works well for dramatic effect for the viewers. First we think they decided to follow their personal goals as school idols even if it means risking things for the school. But then they get the best of both worlds. But it makes the decisions of everyone look pretty dumb. [FFF]inally was able to watch this episode... I have so many questions. How the hell did they get off the tangerine coaster without brakes? Also I don't think taking off the brakes while going down a steep slope is a laughing matter. And why didn't they use a car instead of running the last part? Chika's sisters arrived pretty much at the same time and they drove the whole way >_> I'll enjoy this show more if I just throw the logical part of my brain out of the window. The good parts were the kimono costumes and both songs were great. I swear I have heard the first song somewhere before or at least something highly similar to it. Dia in a Kimono hell yeah. Kanan too. Hanamaru's hair was pretty cute.